The DSAM Code of Conduct went through its second enhancement recently (first enhancement was in 2008) since it was launched in 1998. This Code is modeled after the World Federation of Direct Selling Association’s (WFDSA’s) global model Code. As the DSAM Code exceeds the minimum standards set by WFDSA, DSAM Members are currently benchmarking their practices against global standards. and rewording of key words for more precise definitions. 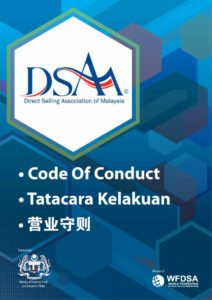 The DSAM Code of Conduct is endorsed by the Ministry of Domestic Trade and Consumer Affairs and WFDSA. DSAM Members will be able to obtain the new Code from the DSAM Secretariat while a soft copy will be sent to Members who prefer to print their own.